Make sure the brand of dark chocolate you are buying contains the true health benifits of cocoa. With new research on the health benefits of dark chocolate, many name brand chocolates are trying to position themselves as healthy, when they don't really offer you any health benefits whatsoever. To identify brands of truly healthy chocolate, you must know what substances in chocolate contain the health value. For example, studies have shown that flavonoids, which are found in dark chocolate, may help to lower blood pressure. But the levels of flavonoids in chocolate depend entirely on how it's processed. Often, milk chocolate, due to its greater processing, has fewer flavonoids than dark chocolate. Typically, the higher the percentage of cocoa found in the chocolate, the more flavonoids (and other healthy substances) it contains. While healthy, organic, raw or minimally-processed chocolates are not yet the mainstream, they are becoming widely available and recognized as a delicious and responsible choice. A healthy chocolate should contain cacao content of 70% or greater. Chocolates containing less have more fillers, more fat and fewer (if any) health benefits. It's important to read the labels. Just because chocolate is dark, doesn't necessarily mean it offers any health benefits. The following chocolate brands have been celebrated for their unique tastes, health benefits and strong ethical commitments. Divine is a farmer-owned company with sustainable development efforts in many countries. The fair-trade Divine Dark Mini Bars are the perfect chocolate treat and contain 70% cacao. 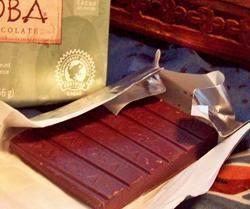 Dagoba makes an award-winning dark chocolate bar that includes chiles, nibs and is 74% cacao. They have coined the term "Full Circle Sustainability" to describe their commitments to ethics and social responsibility. Equal Exchange makes organic chocolate bars with up to 80% cacao that are vegan, gluten-free and contain no refined sugars. They work with fair trade cooperatives and farmers across the world. Ignafire produces natural chocolate with no commercial processing or industrial equipment. They're vegan-friendly and low in sugar. Some are subtly flavored with cinnamon, roasted coffee beans or crushed almonds. Theo uses green energy sources to power their factory along with sustainable packaging and printing methods. Try their fair-trade certified blend that combines chocolate from Ghana, Panama and Ecuador. All of the above brands offer mail order as in addition to being found in health food stores and larger chains such as Whole Foods and Trader Joes.